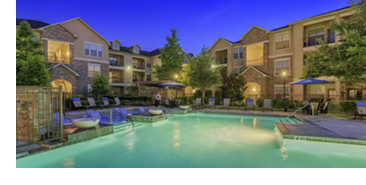 ​​​ ​HOUSTON – The Praedium Group has acquired the Discovery at Mandolin Apartments at 19401 Tomball Pkwy. The property consists of ten three-story apartment buildings with one-, two-, and three-bedroom homes averaging 972 sf, and a clubhouse/leasing office. Built in 2009, the apartments have nine-foot ceilings, kitchen islands, walk-in closets, and full-size washers and dryers. Amenities include a resort style swimming pool, fitness center, dog park with washing station, a cyber café, and an outdoor grilling station with TV. Discovery at Mandolin boasts connectivity to the Greater Houston area via the Sam Houston Tollway, I-45, and ​Grand Pkwy. ​Check out Houston-The Woodlands-Sugar Land​ Multifamily Market Research.